Hanakaʻape Bay was the trans‐shipment point from which ships were off‐loaded with mercantile goods and livestock for Kauaʻi, and where trade‐goods, fresh produce and livestock were loaded on ships from Kauaʻi. It was also linked to Kōloa Town, two miles inland, by the purveyor’s cart path. Archaeologists state that Hapa Trail was constructed over 150 years ago. This cart path is known as Hapa Trail; “Hapa” being a hawaiianization of “Hobbs”, a prominent ship’s chandler. Archaeologists have referred to an ancient name Luahinealapiʻi for the Trail. When the new Poʻipū Beach coastal road was built in the 1900s, Hapa Road fell into disuse and disrepair. 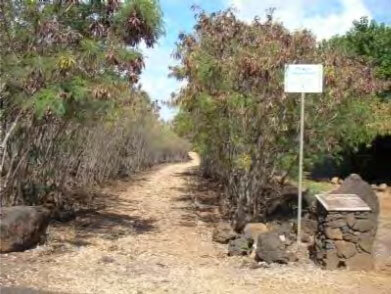 It is not clear why the trail has the ancient Hawaiian “Luahinealapiʻi”. “Luahine” translates to “old lady;” “Alapiʻi” translates to “Stairs, steps, ladder, doorstep, ascent or a musical scale”. Luahine could also be referring to ʻIolani Luahine (born Harriet Lanihau Makekau,) a well‐known hula instructor (kumu hula,) who learned her hula on the island of Kauaʻi. ʻIolani was raised by her great aunt Julia Keahi Luahine (1877–1937), who began educating her in the ancient Kauaʻi school of hula when she was four years old. She later became a highly respected hula instructor. Hapa Trail is a 30‐foot numbered and registered State Historic right of way owned by the County of Kauaʻi. Hapa runs from Weliweli Road in Kōloa Town, 1.8 miles makai to Po’ipū Road. The porti?on of Hapa from Poʻipū Road mauka to St. Raphael’s Church is 1.2 miles unimproved miles and the remaining 0.6 miles to Weliweli Road is paved. Hapa Road was designated a bike and pedestrian way by the County of Kaua’i in the 1960s. In 2008, the Kōloa community decided to clean and maintain Hapa Trail and encourage the use of this dedicated pedestrian and bicycle pathway by residents and visitors alike. Hapa is a cultural and historical path that once connected the people of na ahupua’a of Kōloa and Weliweli. They were intensely cultivated, highly productive, flourishing with sugar cane, taro and sweet potatoes. The Kōloa Community’s Hapa Trail Volunteers have established as its goal: the preservation and perpetuation of the ancient history of agriculture in the ahupua’a of Kōloa and Weliweli.